Sunshine to start, then a few afternoon clouds. Warmer. High 71F. Winds W at 10 to 15 mph.. The Indie Grits festival runs March 28-31 in downtown Columbia. The Indie Grits festival includes more than film screenings. It's also got activities, live music and the Overdue Grits event for adults, hosted by Richland Library. Saluda High School JROTC at a Veteran's Day celebration in this still image from the documentary "Little Saluda USA" by Lillian Burke and Amada Torruella. Charlie Daniel stands on his land in this still image from the documentary "Little Saluda USA" by Lillian Burke and Amada Torruella. A seasonal migrant worker at a South Carolina peach farm. The film "Invisible Hands" by Yulian Martinez-Escobar depicts life on the farm. Migrant workers at a peach farm in the South Carolina Midlands. Yulian Martinez-Escobar is a Charleston-based photographer and filmmaker whose documentary "Invisible Hands" is part of the 2019 Indie Grits Film Fest. 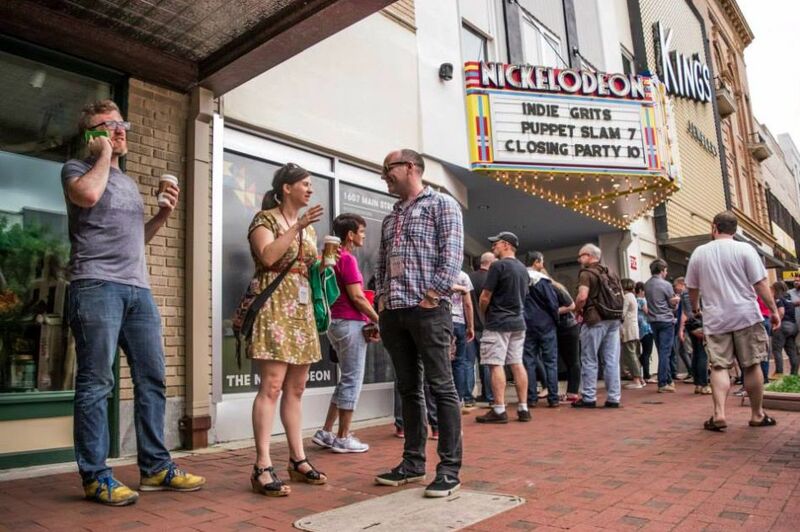 The audience at The Nickelodeon during the 2018 Indie Grits Festival. The Indie Grits festival includes an annual Puppet Slam event. Richland Public Library is hosting The Fist & Spoon Fair, part of the Indie Grits festival in Columbia. COLUMBIA — The Indie Grits Film Fest isn’t a normal film festival — it’s about much more than movies — but its central feature is grassroots cinema, and the festival is gaining a reputation for producing and introducing creative documentaries and occasional narrative features about the South. So call it a film festival with accouterments. Those ancillary events are numerous, bold, hip and far-reaching. More on that in a minute. First, let’s have a look at the movie offerings. The Indie Grits festival, in its 13th year, takes downtown Columbia by storm each spring. Aside from Spoleto Festival USA and Piccolo Spoleto Festival, which are not known for their cinematic offerings, Indie Grits is the biggest arts event of its kind in the state and one of the biggest in the region. It’s a project of Indie Grits Labs, a year-round enterprise that organizes community-based art projects, education outreach initiatives and the festival, set for March 28-31. The nonprofit, in North Columbia, operates in tandem with The Nickelodeon — or, The Nick, as the locals call it — a nonprofit art-house cinema on Main Street that becomes Ground Zero when the festival is under way. Both organizations function under the auspices of the Columbia Film Society. The Indie Grits Film Fest includes 90 movies, 48 of them documentaries, reflecting what organizers say is a trend. Yet documentary filmmaking receives little support from state organizations, noted Indie Grits Labs Director Seth Gadsden. “We see a niche needing to be filled,” he said. Torruella and Burke have been working on their portrait of the small town of Saluda for more than a year. “It’s a collage of experience,” Torruella said. And it presents a sometimes surprising view of the rural South. “People think rural people are not so cultured,” Burke said. But the filmmakers found a variety of thoughtful and informed people, including political activists with long histories of contributing to their communities, they said. In capturing them on film, viewers can gain a more nuanced understanding of small town life. “Part of the Rural Project is to make a space for these people in the media,” Torruella said. The documentary is a poetic and immersive look at the dynamics of Saluda, where white, black and Latino communities live mostly apart. Another of the seven movies screening Thursday night is “The Last Stand," a documentary by Kelly Creedon about the controversy over the Confederate flag near the Edisto River Creamery in Orangeburg. The only work of fiction is the art film “Ten Toes Down” by Cedric Umoja of Hopkins, who explores the mystique of the land. “Invisible Hands” is a work in progress that portrays the daily routines of seasonal migrant workers on a large South Carolina peach farm. Martinez-Escobar, a photographer and filmmaker who teaches Spanish at Trident Technical College and the College of Charleston, said his goal is twofold: to document life on the farm and to show viewers the community of people behind the food they consume. “They don’t see their children grow,” he said of the workers who spent seven to nine months at the farm each year. “They’re home for a few months, then they’re back here.” Yet they find opportunities to seek out life’s small pleasures. On this farm, about 800 migrant workers live in a camp, but they have basic amenities such as heating, air conditioning, a clean place to cook and dine, and transportation to and from the laundromat, grocery store and restaurants, Martinez-Escobar said. The Rural Project is Indie Grits Labs’ most ambitious effort to date. In years past, festival programming relied on a particular theme — for example, the Latino experience (“Visiones”) or climate change (“Waterlines”). But organizers worried that such themes were restrictive and discouraged some people from partaking in all the festival offers, so they abandoned them in favor of the broader parameters that guide such enterprises as the Rural Project. Nevertheless, certain themes can be discerned, such as the social and economic realities of life in the South, questions of identity and diversity, and community engagement. Funded by a National Endowment for the Arts Our Town grant, Mahkia Greene, 24, an educational instructor with Indie Grits Labs, has been working closely with 60 students at Lower Richland High School in Hopkins. The students get to try their hand at various art forms, expressing their struggles and ideas, Greene said. To stimulate their thinking about the meaning of community and life in the region, Greene took them to see the sprawling “Southbound” photography exhibit mounted by the Halsey Institute of Contemporary Art, which closed earlier this month. The “Lower Richland StoryLab” film created by Greene and her students as part of the Rural Project portrays the young people exploring their community and its potential for change. Indie Grits Labs is cultivating a community of artists whose contributions help grow the organization and open new doors. Torruella has been involved for a few years. She spearheaded the “Visiones” project in 2017. Burke won the 2018 Experimental Grit Award for her autobiographical documentary “Ruth.” The school outreach has expanded. A growing number of filmmakers are submitting work to festival curators for consideration. And local filmmakers increasingly are finding a place within the enterprise. Gadsden said the focus on documentary and journalistic film-making has been paying off, and soon Indie Grits Labs will assemble a moving movie theater, something it can take on the road as early as this summer or fall in order to screen films around the state. “It’s an exciting time for grassroots filmmaking,” Gadsden said. But what about the accouterments? There are many. Opening Night in Cottontown features 10 bands in three venues, along with a special food and beer menu. A Filmmaker Focus series includes workshops, panel discussions and screenings of works in progress. Richland Library is hosting “The House of Sweet Magic,” featuring numerous works by filmmakers age 3-18. The library also is hosting Overdue Grits, an event featuring a range of activities for adults, such as block printing, jewelry making, magazine production, video games and more. Food from Village Idiot Pizza and drink from Curiosity Coffee are an essential part of the fun. The Indie Bits Arcade celebrates independent interactive media, including video games, board games and virtual reality. The Columbia Museum of Art will host The Fist & Spoon Fair, which includes a sampling of mixed media works, a puppet slam, movie screenings and more. Entertainer Toby Lou returns to the festival to host The Weekly Revue, featuring special guests ZY Year and Bill and Turner Ross. A Closing Night Dance Party features Breathers of Atlanta; Zensofly of Raleigh, N.C.; Infinitikiss of Charleston; and headliner 10th Letter of Atlanta. For more on Indie Grits Film Fest, including a full schedule, event details, passes and tickets, go to indiegrits.org. Contact Adam Parker at aparker@postandcourier.com or 843-937-5902.